J•DRAIN products have been used in several different applications around the world. Whatever the drainage challenge J•DRAIN has the water-tight solution that is affordable, easy to install and lasts a lifetime. Photo courtesy of Atlanta City Hall, Dept. Watershed Mgmt. 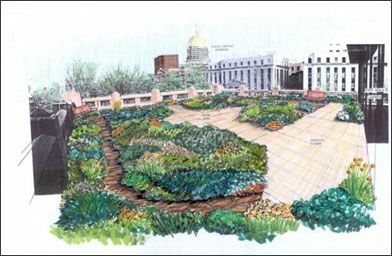 Atlanta City Hall Green Roof is the first municipal project of its kind in the south. The project, located in the heart of downtown Atlanta, offers aesthetic and functional benefits for City Hall and Atlanta. The greenroof not only contributes to stormwater management, reduced heating and cooling costs, water quality improvement and heat reduction, but also serves as an outdoor patio amenity for employees and visitors. The greenroof is open to the public and is accessed from the fifth-floor cafeteria. Installation of J•DRAIN GRS (high strength dimple core and two layers of geosynthetic fabric attached top and bottom), took one day and covers the entire roof. J•DRAIN GRS dimple core root barrier filter fabric placed on top layer will prevent roots from impeding the drain core and allowing maximum drainage. The green roof has no irrigation system; consequently, the water retention chambers of the drain core will store excess water. Concrete pedestal pavers, soil, stepping-stones, and 3000 plants were installed directly on top of the J•DRAIN GRS drain layer. J•DRAIN GRS fifty-foot rolls are easily lifted and transported up the freight elevator and out to roof area. J•DRAIN GRS is applied over the entire roof area. Drain boxes are cut out for easy access. Additional root barrier filter fabric is applied up the side of parapet wall. This prevents roots from impeding the drain system or damage to wall. "Engineered" soil, pavers and plants go directly on top of J•DRAIN GRS.